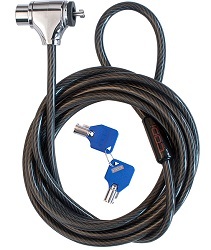 CODi's Key Cable Lock works with the universal security slot of your laptop or desktop computer, protecting your device against theft. The patented design features convenient, easy-to-use push-button technology to easily lock and unlock your device. A hardened steel head, 7-pin lock head/tail pin and 6' coated, galvanized steel cable ensure superior strength and deter tampering. Carry this lightweight, portable and compact security solution anywhere your job takes you.